Assessment data needs to be uploaded from KAMAR for each year changing the dropdown at the top and the following the instructions on the page. If your courses change you will also need to upload coursedepartment.csv file… click here for full details. We normally update our data on a daily basis through the Auto Upload Scripts. Once set up you no longer need to do regular exports from KAMAR to upload into Assay, as it is all done automatically. The only times you’ll need to upload data is to load historical data eg: in Jan to load the final NCEA results from the previous years or when initially setting up. Once a year has been completed you don’t need to upload those files again. I.E. after the external results for 2016 are in KAMAR in early 2017, you do one final export for 2016, and then only do 2017 from then on. The first year should be the first year that you have full data for… as at this writing (July 2017) that would be 2016 unless you have backups of KAMAR as KAMAR used to remove data from its database 12 months after students leave (it no longer does this). If ticked it enables the health and safety module for all users. This will give users access to the admin section in the moderation view. From the admin screen inside moderation you can grant access to non-admin users to the moderation section. 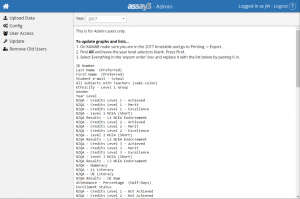 This is done so that the person who manages moderation can have full control over that section without needing to make them an admin for all of assay3. This will give users the ability to view and edit locations, incidents and hazards in the health and safety module. 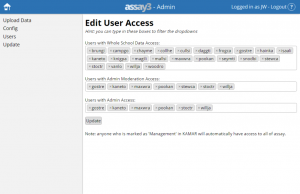 This will give users access to this admin section. Note: anyone who is marked as ‘Management’ in KAMAR will automatically have access to all of assay to prevent schools from getting locked out. When an update is issued you can enter the password that is sent out in here and press the update and assay3 will be updated for you. In order for this to work the web server needs to have write access to the folder that it is in. Remove old users that are either causing conflicts with current users or who you no longer want to have access to the system.